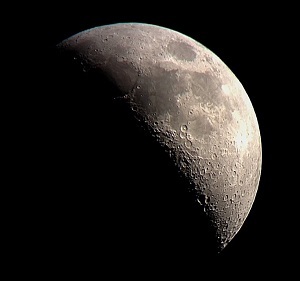 According to their site: "The AccuWeather.com Stargazing Forecast considers weather conditions and the lunar cycle to forecast the peak evenings for amateur astronomy." 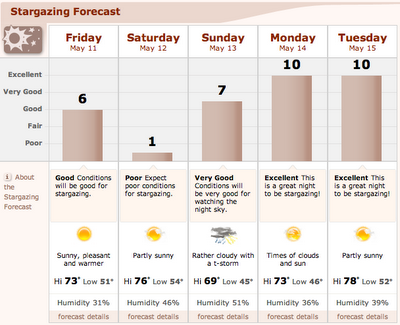 Last night, they gave the sky a 9 out of 10, and they accurately predicted clear skies two days in advance. As you can see from the simple chart, it looks like some perfect skies are coming up the first part of next week. In the astronomy blog circuit, it appears that the most popular stargazing forecast is the Clear Sky Chart from cleardarksky.com. Although this chart is super straightforward and compact, I find it difficult to tell the colors apart just by looking at them. Each color corresponds to a different rating along a gradient, and there are only a few shades between 0% and 20% cloud cover. So maybe I'm just a noob, but I prefer the 10 point ranking system for now, you can keep your color gradient for "seeing" and humidity.